This Fashion Shopping Site Is *Always* On Sale... You're Welcome! We 21st Century girls are very hard to please, aren’t we? It takes ages and tonnes of effort to convert us into loyalists. Especially when it comes to clothes and accessories. We think about quality, comfort, price, variety and convenience. There are some brands that knock it out of the park with respect to all and one such brand is Lulu & Sky. Take it from a picky 20-something-year-old - the fashion brand is nailing each and every deciding factor for you. Great quality products that are stylish and comfortable AF. Yes to variety, too! Lulu & Sky has clothes, accessories and jewellery for every fashion girl ever. And it’s all one click away! Shelling out cash isn’t a problem either, because every time you log on, your heart will swell with happiness - they always have a sale going on. And by always, I mean all the frikkin’ time. All day, everyday… on everything. Dresses, footwear, bags, you name it. When it’s too hot for jeans but you have an undying love for denim, what do you do? You add this two-in-one shirt and dress combo to your Lulu & Sky cart! We love this dress because it’s blue and white, ideal summer colours and that it’s on sale at 74% off! Also, styling it is a no-brainer. Style tip: Wear it with white block heels and a day bag to nail your lunch-date look. When you get an extraordinary pair of statement sunglasses, that too on sale, you never pass up the opportunity! These pink tinted pearl embellished beauties will sail you through a sunny summer while adding to your style quotient. Also, did I mention they’re for Rs 550 only? Yep, move fast. You can never have too many cross-body bags, can you? Especially this one from Lulu & Sky, you need it in your life. We love the chic design, the oversized buckle and the sophisticated colour. Work a street style look with wearing this bag with an athleisure outfit. Or sling it over an LBD for a party look. 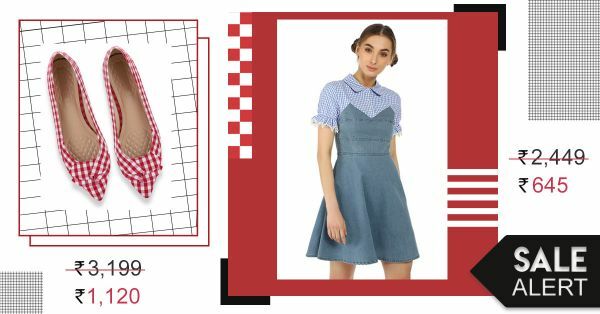 ‘Tis the season to ‘gingham’. These red and white checkered pointed-toe flats are quirky and would uplift any basic outfit you choose to wear with them. Change up your old t-shirt and jeans this summer pairing by adding this discounted pair to the outfit. Originally for Rs 3,199, now for Rs 1,120 only these flats from Lulu & Sky are priced at 65% off.